They are all beautiful, but I believe the Treetop Flyer may be my favourite - I love the woodgrain and I'd quite like a pair myself, thank you! OOOO - you said you were drawing Pixie boots! OMG! everything U create is great!, I admire your work... and my fav. pixi boots are the last ones XD! If I had drawn just ONE of those I'd be in awe of myself. To have so many in such a wonderful composition is an incredible accomplishment. Amusing and beautiful, a winning combination. How long does a piece like this take you to draw? I work in pen and ink (dip pen) and each drawing takes me forever. 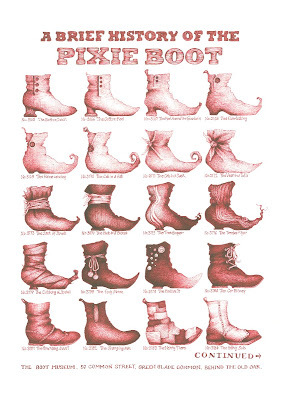 The boots and the bonnets make me think of the paper dolls I loved as a child. And some beaks are longer than others. Andrea, I have been following your sketching blog for about 6 months. You blow me away with your creativity and ingenuity! I never know where you are going next. I love not knowing and being surprised and delighted. I appreciate you and your work. Oooo I need to see this up close! How about a couple of photographs of it as well? I've replaced the first scan with a (hopefully) better one. So, if you click on it you should get a better view. Kay, 20+ hours. A long time over a few days. Thank you all, guys. I might add some photos of this soon. Cheerio, my ducks. Oh wow! Andrea, can you find a boot maker to actually make me some of those??!!?? Wow! I've only just found out about your blog through Twitter and haven't got time to tell you how wonderful it is - I'm off to revel in some more. Absolutely fantastic!